Both, the theory and practice prove, that every port has to have spare territories for own development, in order to respond to unsuspected changes of the transport market. This is necessary, even if at the moment the port has reserves of capacity as is with KRZ PORT BURGAS. With this reference Dockyard Port-Bourgas has commenced investment project for enlargement. A general plan and preliminary design for enlargement of the port are worked out. The present project of general plan is worked out in accordance with Section IV of Law for marine spaces, internal water roads and ports of Republic of Bulgaria (LMSIWRPRB) for enlargement of port for public transport with regional importance and Dockyard Port Bourgas, as well as in accordance with Decree № 39 since 21.12.2005 for the range and the content of the general plans for development of the ports for public transport, issued by the Minister of Port and Minister for Regional Development and Urbanization. 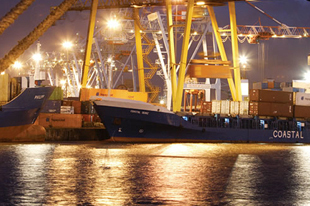 In the project, basing on expected cargoes are pointed the necessary technological and organization actions for development of the port, aiming the rising of its efficiency, advisability and exploitation ability. - Territorial differentiation of independent zones, which situation is considered with their functional commitment. - Warehouses to be optimally situated according to loading/discharging fronts, to ensure the necessary warehouse volumes with appropriate conditions for preserving, according to specific requirements of different types of cargoes. - Truck and rail ways towards separate loading/discharging fronts to respond to the size of separate cargo streams and their crossing to be avoided. The geometrical configuration and situational location of the port towards aqua territory allow building of 2 more ship’s berths, configured under angle one to each other, closing the existing unassimilated lagoon between “Dockyard Port Bourgas” JSC and “Transstroi” JSC. By this way, aqua territory with area about35 000m2 will be gained, which together with the existing will be enough for building of the necessary warehouse equipments and loading/discharging fronts. The total built 4 ship’s berths with corresponding equipment, including wide range handling equipments, as well as with the universality of the warehouse equipments to them, don’t have strict specialization and could be used as equipment with general function for handling both general and bulk cargoes. - One ship’s berth as continuation of the existing wharf with length 145m. The filled lagoon will form back area behind the wharf with over 30 000m2 surface, with enough wide for differentiation of opened loading/discharging and warehouse ground. In the general plan this ground is predicted to be used for handling and preserving of cargoes which allow being stored in open place. For wharf’s loading/discharging activity, having in mind the approved tradition, electric portal railway cranes are being predicted. The rail way will be prolongment of the existing from the second ship berth. Between the rail span of the crane is predicted to be made railway, which will lead to possibility for direct handling of the cargoes according to schedule “vessel – crane – wagon” and backwards. On the attached drawing it is shown the connection of the fore rail ways with the ones passing the frontiers. Traffic capacity of the built ship’ berth will depend on the type of handled cargoes and the number and technical data of wharf equipment. - Second ship’s berth with length 165m will be built parallel with the frontier with “Transstroi” JSC. Due to insufficient rear areas behind the berth, the most expedient is the wharf to be specialized in handling of bulk grain cargoes. For this purpose it is predicted to be equipped with 2 loading/discharging machines with continuous action. The traffic capacity, which may be achieved, is up to 1 020 thousand tons per year. For preserving of grain cargoes it is predicted building of specialized grain warehouse, consisting of 8 cells with capacity 5 500 tons each, elevator tower and respective feeding cells, as well as rubber belt conveyers (RBC). Thr transport of the grain cargoes between grain warehouse and wharf loading/discharging machines will be carried out by means of system of RBC in covered elevator, disposed behind rear railway, situated under crane, parallel to the wharf. For performing of loading/discharging works to road vehicles transporting grain cargoes will be built closed loading/discharging place, equipped with system of lifting-transport machines with continuous action for taking on/off and transporting of the cargo to/from the facilities of the grain warehouse. The specialized loading discharging place for wagons is predicted to be made at railway, traced between existing mechanized opened warehouse and northwest frontier of the port. - Differentiation of closed warehouse – will be carried out internal rearrangement of the rooms by removal of all auxiliary compartments and shifting of the available machines. The closed warehouse will have dimensions 96m x 48m, equipped with 2 existing cranes with lifting height 6m. The existing railway passing along northwest frontier of the port allows building of branch to the port. It will be built railway to the internal part of built closed warehouse. The total wide of both compartments allows after reconstruction of the floor with smooth lifting of the flooring with admissible slope 1,5% from wharf side to 1,75m to axis of the railway in the hall, receiving of railway ramp, by which will be possible closed wagons to be handled. - Differentiation of mechanized opened warehouse. For this purpose on the opened area – behind first ship’s berth will be fitted one gantry crane with loading capacity 12,5 tons and rail span 25m. - Mechanized opened warehouse at northwest end of the ground – It is predicted its prolongment on account of removal of existing purifying station.